WOW. I was not ready for how awesome this film is. Admittedly, I was never really a fan of Queen, with one of my most hated songs of all time being Don't Stop Me Now. But when I saw the trailer for this, I knew I had to see it. And to be honest, it has converted me a little. I mean, who doesn't love Radio Ga Ga? I also am beginning to like Bohemian Rhapsody — which past me would have shuddered at...(I know I was like, the only one who didn't). Ok so I know I am late to the party. I had been meaning to see it since it came out last year, but hadn't got around to it. So when my mum suggested going to the cinema to catch it before it closed, I knew I had to. And I am so happy that I did. Directed by Bryan Singer (the X Men series, The Usual Suspects), the cinematography is fantastic and the music (of course) gave me goosebumps. Rami Malek is absolutely spectacular as Freddie Mercury. He has the mannerisms down to a tee, showcasing how Freddie went from being a Baggage Handler for British Airways to one of the world's most iconic superstars, performing to millions at Live Aid. Brilliantly portraying the heartache, joy and charisma of Freddie, it's clear why he won the Best Performance by an actor at the Golden Globes. The casting overall is amazing in this motion picture. 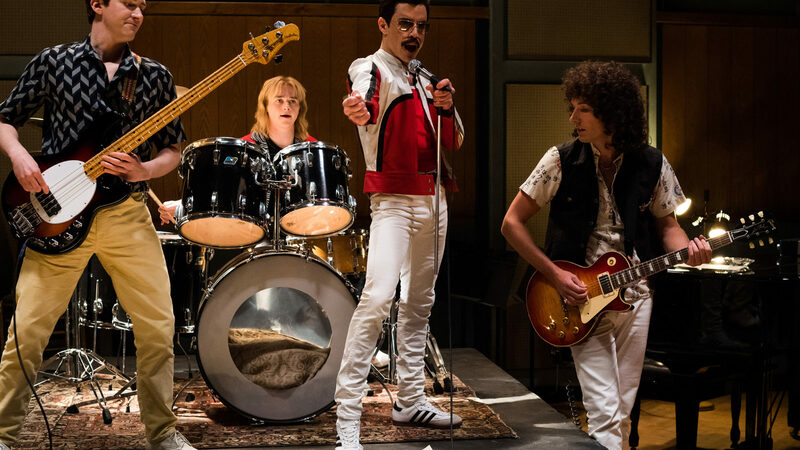 Gwilym Lee is perfect as Brian May, Ben Hardy shines as Roger Taylor and Lucy Boynton wonderfully portrays Freddie's ex-fiancee Mary Austin. I felt completely immersed throughout the film, seeing how Queen began and how they made their mark on the world. Shattering all stereotypes made against them, they brought a revolution to the music industry. Lasting just over 2 hours, I thought that it could be a drag. But, I was mistaken. The time flew by, and by the time it got to the breath-taking Live Aid scene, I didn't want it to end. When it's discovered that Freddie has AIDS, I was holding back the tears. It's an absolutely beautiful film through and through. I can't even think how to fault it (I know, this is unexpected coming from me). I really want to sit down and watch it again, but think that it deserves a cinema screen to watch it on. I can't recommend this film enough. Every element is fabulous and makes you want to jump out of your seat and sing along.